To lighten the mood in these politically extreme days Juliet Wood and I headed off to the Fashion and Textile Museum in Bermondsey, South London for a few hours to admire a collection of fabulous frocks from the 1920s. 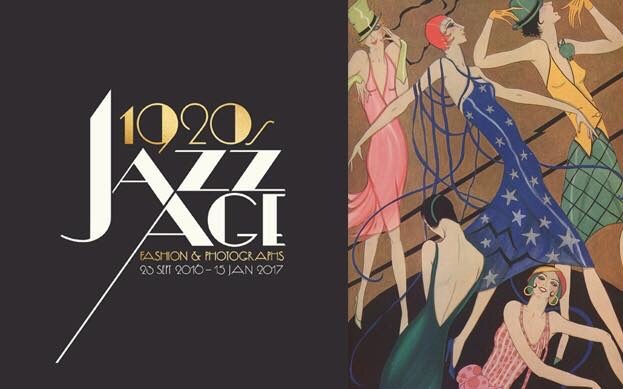 The exhibition is a showcase for a collection of wonderful 1920s outfits and photographs. After the suffering and trauma of the First World War the 1920s was a decade of recovery, survival and jubilation. In New York and London the wealthy enjoyed life. In Hollywood the movie studios churned out films featuring glamorous actresses, beautiful gowns and romantic settings. Ladies were keen to emulate the fashions they saw on the big screen. There was a Fashion for a boyish style, which the French called ‘garconne’ pioneered by Coco Chanel in Paris. Styles for women were gentler, often drop-waisted, with loose, shift style silhouettes. It was all about elegance, sophistication and emancipation. A night on the town ladies! Stylish black velvet, silk and satin for the evening. Costume and outfit was important, whatever your role. The exhibition is beautifully constructed. Dresses are grouped together, as day wear, evening attire and even a selection of light and bright gowns suitable for afternoon tea. The delightful pastel shades remind me of a scrumptious selection of cup cakes. In the 1920s pyjamas were all the rage, the idea of wearing loose fitting lounge wear in relaxed situations was very popular. Pyjamas and pyjama-style two piece outfits appeared in patterned satin and silks. A lady wearing a silk pyjama suit whilst smoking a cigarette from a long ebony cigarette holder was regarded by many as the epitome of style. Think of PG Wodehouse and his characters Jeeves and Wooster. Jeeves was a competent and highly intelligent butler or valet. He worked for, but more importantly, guided,directed and organised his young, aristocratic, employer Bertie Wooster. If you think of the ladies in the PG Wodehouse stories, you can easily imagine them dressed in a silk, embroidered afternoon tea dress. Or inviting a hapless Bertie for a game of tennis. In the 1920s anyone who was anyone in Europe travelled to New York on an ocean liner to experience the bright lights and big city of Manhattan. It was vital that wealthy ‘young things’ were appropriately dressed at all times. After all, you never know who you might meet on deck when taking the evening air. Many an impoverished British aristocrat, usually young and male, set sail across the Atlantic, his mission to find a wealthy American wife, preferably an heiress. This young heiress could then inject the much needed cash into the maintenance and renovation of the young aristocrat’s country house. The young ladies would be outfitted in elegant silk shift dresses, soft, pale crepe day dresses and casual skirt and jacket outfits. The more daring may even sport swim wear, in stretch jersey…………………. A fine selection of cruise wear – ideal for life on the ocean! Probably my favourite garments of the whole exhibition are the silk tennis dresses, designed with the active, sporting lady in mind. These dresses were typically sleeveless and loose fitting. Even when the wearer was serving or volleying it was essential that the dress fell back into position, perfectly on the body, the minute the shot was completed. The model on the left wears a tennis dress with loose fitting wool blazer. Whilst the dress on the right was made especially for a well-known lady player of the time, she accessorised the dress with an orange bandana and immediately became a fashion icon of the 1920s. Upstairs in the same exhibition there is a collection of fine photographs depicting the Dolly Sisters, Fred Astaire, Noel Coward and Ivor Novello. All well known performers of the period. There’s even a photo of Marion Davies, the actress and long term mistress of William Randolph Hearst. The 1920s was a decade of enjoyment and excess for the wealthy classes. A time of theatre, night clubs, entertainment and travel on both sides of the Atlantic. Hollywood produced and exported it’s idea of glamour to Europe and the Europeans lapped it up. Well let’s face it we are all suckers for a pretty face, a smart suit or a sparkling evening gown. An hour or two of fantasy is just what the doctor ordered. I LOVE fashion, love seeing it, love talking about it, love reading about it. This exhibits looks like one I would stay hours in. Thank you for your beautiful photos and lively descriptions and background of the different types of clothing, Janet!